The only performance that makes it, that really makes it, that makes it all the way, is the one that achieves madness. According to legend, the wife of a Warners executive vomited during a test screening; the studio seriously considered destroying the negative; and at a sneak preview, most of the audience walked out. Shelved for two years, the film was savaged by reviewers when it was finally released in 1970. If there had been an Academy Awards category based on the reviews, Performance would have copped the Oscar for the most pretentious, repellent, disgusting, fundamentally rotten, and completely worthless motion picture of 1970. One thing you can say for Harry and his lads is that they clearly enunciate every Soho-salty syllable, in contrast to the night world language of the stoned out Notting Hill Gate underground where everyone speaks and moves as if in a dream. In fact, the gangsters are the real performers. 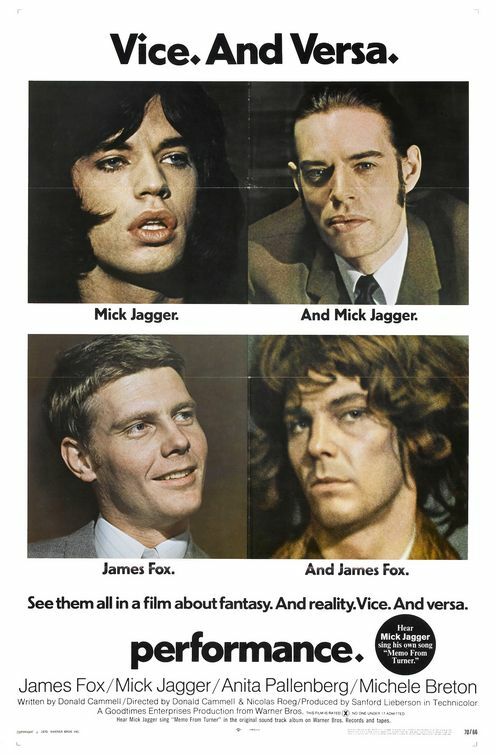 Jagger and the others, and even eventually Fox, are like existential moving parts in a visual phantasmagoria based on Cammell’s stranger-in-a-strange-land concept and Roeg’s visual style of impressionistically fragmented cross-cutting, a cinematic variation on Burroughs’s literary cut-up technique similar to what he calls “disease on the image track” in The Ticket That Exploded. What makes the song and flavors the whole film, along with the anarchic spirit of Burroughs, is the playing of the other American on the scene, Ry Cooder, whose rich, crystalline, gorgeously gritty slide guitar is as crucial to the ambiance of Performance as it will be a decade later in a far greater film, Wim Wenders’s Paris, Texas. I keep having this fantasy of an Oscar night telecast where Fox and Jagger show up to accept the award for most pretentious, repellent, disgusting, fundamentally rotten, and completely worthless motion picture of 1970. The stars are there in place of Cammell and Roeg, who have wisely avoided the festivities due to not entirely playful threats of tarring and feathering. Best case scenario, the Oscar would be presented by the Warner exec’s wife who famously vomited, all smiles now that Performance is already on the way to cult status as everyone’s favorite Midnight Movie. Jagger and Fox are engaged in the usual banter, both in character. 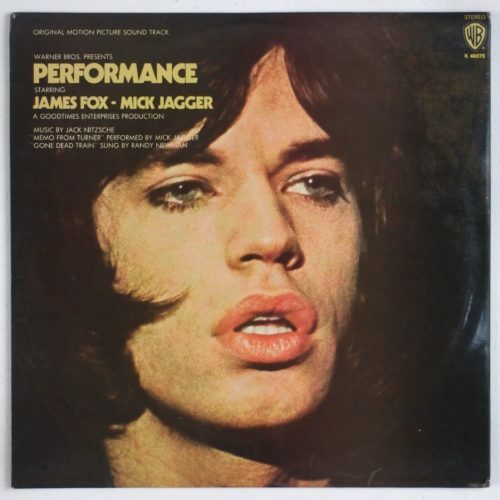 At one point Jagger puts on a rubber mask and becomes Chas as Fox becomes Turner, playing out the identity dynamic of a film where the utimate achievement of the madness of performance is the film itself, which finally makes it, really makes it, by going all the way. James Fox (born 1939) and Mick Jagger (born 1943) are still performing, Fox in the series London Spy and as Lord Aysgarth in Downton Abbey, and Sir Mick with the Stones on the No Filter Tour, which is scheduled for Met Life Stadium June 13 and June 17. Nick Roeg (1928-2018) died last November at 90, and Donald Cammell (1934-1996) committed suicide in April 1996. One must at least wonder why 'Come On' has been performed only One-ish times by the Stains since 1965. Was 'Come On' lyrically and sounds-wise about 'wrestling with the one-eyed vessel, of cuffing one's carrot, of one-night-stands-with-ones-ding-a-ling, when it wasn't strictly necessary, frankly? Is there any photographic proof, apart from Jogger 're-arranging myself' on stage, of the band members engaging in painting the flagpole, of Come On (the sheets)', of them scouring the tower of power, of a slight bit of winky-wanky-wooing? I say all this with respect and in the best possible taste.